Looking for an oil free sunscreen? PROTECTION against the complete spectrum of daily environmental challenges UVB, UVA, Infrared­‐A (IR-‐A) and visible light. Uniquely SPF50+ and broad spectrum UVB|UVA protection is combined with the Heliocare® 360° BioShield System of Fractional Biomimetic Melanin and Pro­‐Taurine providing additional advanced biological protection against high energy visible light and Infrared‐A radiation. The BioShield System absorbs high‐energy visible light at the skin’s surface and helps neutralise the action of infrared-A within the skin. PREVENTION of the damage the ROS/ free radicals generated by these daily challenges can cause using the clinically proven and patented Fernblock® Polypodium leuctomos extract contained in every Heliocare product. Fernblock® is a natural complex containing powerful polyphenol anti‐oxidants such as ferulic, caffeic and vanillic acid, supported by extensive peer review published evidence of it’s high level skin anti-­oxidant efficacy. 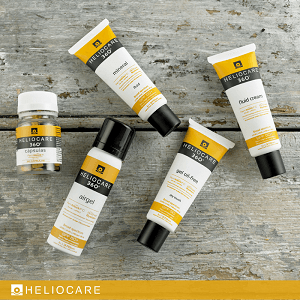 In Heliocare 360ᴼ this is fortified with additional ferulic and caffeic acid to make Fernblock® FC, with an antioxidant activity up to 4x greater than Fernblock® alone. The Heliocare 360ᴼ antioxidant prevention effect is further enhanced by the addition of Vitamin C, E & Green tea extract. REPAIR of DNA damage. DNA in skin cells can be damaged by it’s absorption of UV and through oxidative stress caused by ROS, this can accelerate skin­‐ageing and impair skin-‐health, in the worst case leading to skin cancer. Fernblock®FC can help reduce DNA damage and natural plant-derived DNA repair enzyme ingredients in Heliocare® 360° can help reduce the level of DNA damage. Unique oil-free dry touch texture with advanced filters and Bioshield System that provides broad spectrum protection against UVA, UVB, Visible Light and IR-A. Enriched with Fernblock® FC for powerful antioxidant activity, and actives which repair sun damage, such as DNA damage and premature skin aging. Enriched with anti-bacterial, anti-microbial and sebum controlling technology, it is recommended for sensitive and acne prone skin. Its oil-free dry touch formulation makes it particularly suitable for normal, combination and oily skin types, reducing shine caused by humid climate. Paraben free.